Compressor: The compressor is the pump unit of the A/C system. It is powered by a drive belt connected to the engine's crankshaft or for some hybrid vehicles electricaly driven. When the A/C system is turned on, the compressor pumps out refrigerant vapor under high pressure and high heat to the condenser. Condenser: The condenser is a device used to change the high-pressure refrigerant vapor to a liquid. It is mounted ahead of the engine's radiator, and it looks very similar to a radiator with its parallel tubing and tiny cooling fins. If you look through the grille of a car and see what you think is a radiator, it is most likely the condenser. As the car moves, air flowing through the condenser removes heat from the refrigerant, changing it to a liquid state. Receiver/Dryer: This is the storage tank for the liquid refrigerant. It also filters, and removes moisture from the refrigerant. Expansion Valve: The expansion valve, which is normally factory set to the Air Conditioners manufacturers specification, is probably the most important component in the system. It is designed and pre-set to control the flow of liquid refrigerant via its orifice valve which allows expansion from liquid to vapour (hence its name) as the refrigerant leaves the expansion valve and enters the evaporator, Vast problems will happen if the orifice is allowed to block up with foreign matter. Evaporator: When the liquid refrigerant reaches the evaporator its pressure has been reduced, Thus by the nature of the refigerant it absorbs the heat content and making it much cooler than the fan air flowing around it. This is because the refrigerant to absorb heat from the warm air and reaches its low boiling point rapidly. The refrigerant then vaporizes, absorbing the maximum amount of heat. 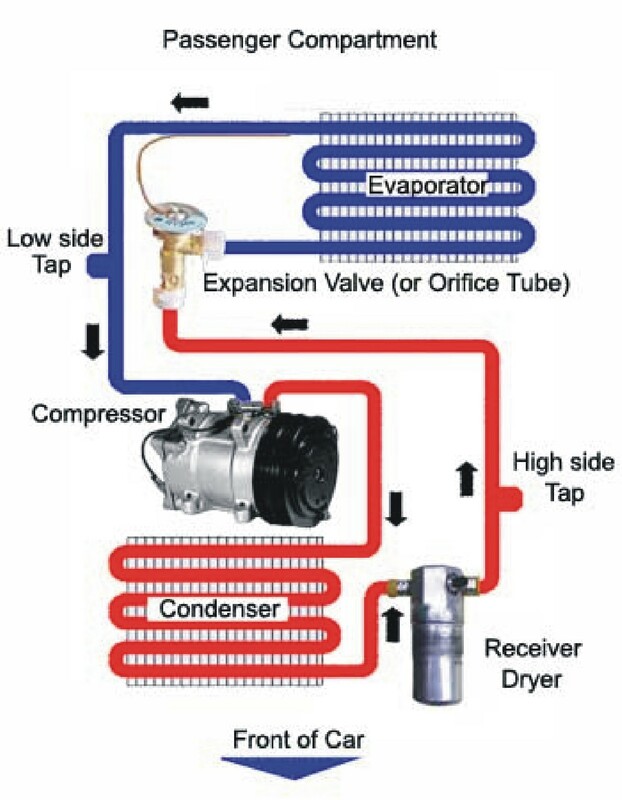 This heat is then carried by the refrigerant from the evaporator as a low-pressure gas through a hose or line to the low side of the compressor, where the whole refrigeration cycle is repeated.